Kelps are large, rubbery brown algae that from in sense stands off sheltered to moderately exposed rocky coasts in cool (≤ 68° F) temperate waters of both hemispheres. They flourish where the continental shelf has a gentle slope and where hard surfaces are available for the attachment of their holdfasts. Kelps can be found at depths up to 130 ft and as far as 6 miles off the coast. Anchored on the seafloor, individuals reach to the surface, where their blades rock on the waves. Smaller kelps and red algae form an understory. Together they create a three dimensional habitat that hosts diverse animals. Kelp forests are highly productive and they quickly recycle nutrients so that most stay in the system. Waves break off tips of blades and uproot kelps during storms, releasing DOM, which bacteria absorb and direct through the ever-important microbial loop. Bacteria are consumed by zooplankters; or adhering to marine snow, they sink to the bottom, where filter-feeding benthic organisms such as tunicates, mussels, and sponges fed upon them. Uprooted kelps drift out to sea or onto beaches, where they are stranded and become wrack. Terrestrial amphipods and isopods feed on the dead kelp. At sea, sea urchins graze living kelp. Occasionally, for reasons not well understood, populations explode and overgrazing leaves an empty patch covered only with diatoms, encrusting red algae, and filamentous green algae. It may take 4-6 years for the forest to recover. 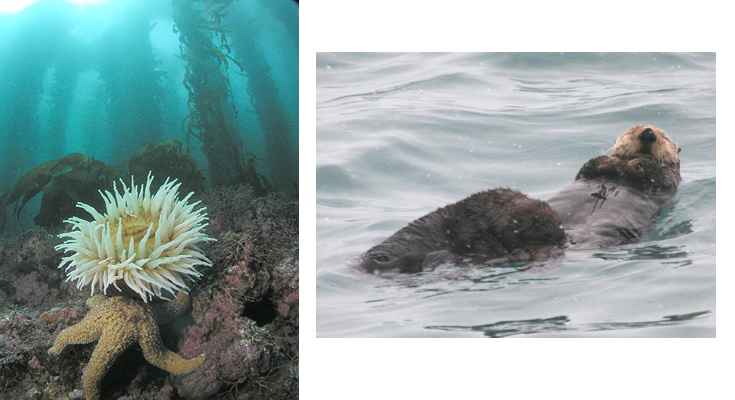 Off the west coast of North America, sea otters are predators of sea urchins and abalones, which also graze living kelp. Off the east coast, before overfishing decimated their numbers, Atlantic cod were important urchin predators. In the kelp beds in the Gulf of Maine, the dominant kelps are horsetail help, sugar kelp, and sea colander. The Red alga known as Irish moss is a major component of the understory. 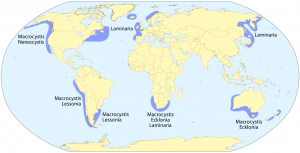 Limpets and periwinkles, as well as sea urchins, feed on the kelps. In the understory, amphipods, isopods, shrimps, and young crabs comprise the motile invertebrate community. Sessile invertebrates include hydroids and tunicates that grow on the kelps and red algae. Predators include lobsters, crabs, sea stars, and fish—including winter flounder, haddock, and wrasse. Sea ducks feed on invertebrates and small fish. Among those visiting the kelp beds are Red-breasted mergansers, Common Goldeneye, and Long-tailed Duck. Wrack along beach at Cape of Good Hope; close-up showing rubbery nature of kelp.